Homemade landing pages are infinitely more customizable. If you want to create a page that goes beyond the limit of standard fonts and buttons, you should probably code it yourself. Custom landing pages are more economical. You don’t have to keep paying a third party service to support your page, nor do you have to contract an engineer to build it. If you’re looking for more customization at a better price, and you have a little bit of HTML and CSS knowledge, then you’re probably ready to code your own page. Here are 9 steps to code a custom WordPress landing page that’s optimized to your company’s needs. To create a custom WordPress landing page, you must first create a child theme. Since parent themes should never be customized, child themes are a great opportunity to create unique pages designed for your audience. Creating a WordPress child theme is very simple, so I won’t go into too much detail on how to build one. If you need some guidance, here’s a great tutorial on how to create a child theme in WordPress. Now you can install and activate your child theme. To create and test WordPress themes, I prefer to set up a WordPress site locally on my PC. You can very easily set up a WordPress site on MAC or Linux You can also use Windows with WAMP server, MAMP server or Bitnami WordPress installer. Next, upload your theme and activate it. To make sure your child theme is working, try adding some simple styles. Add the following styles in your child theme’s style.css file and reload your front page. Now, we’re going to create a new custom page in our child theme. 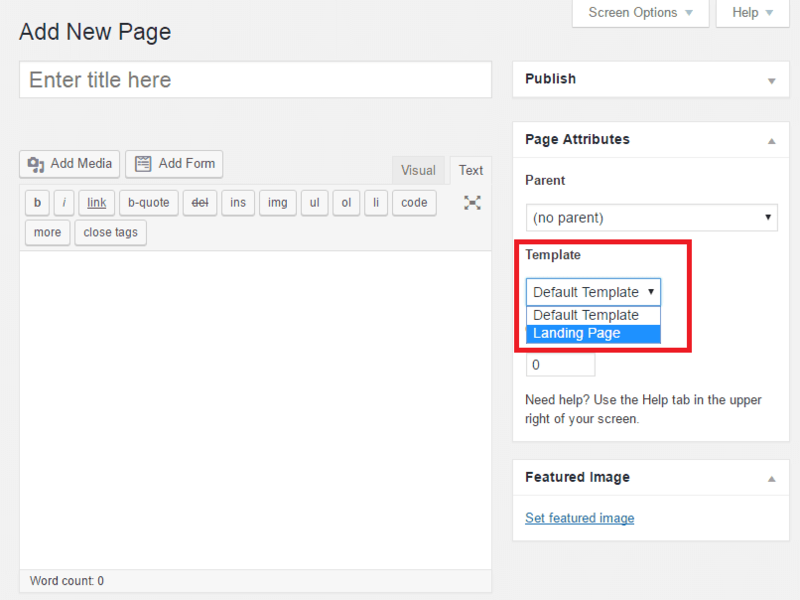 Create a new file in your child theme and save it as page-landing.php file. Under the Template dropdown, choose your landing page. Add your copy and set a large image as the feature image (this will be your landing page background). Then, publish this page. If you preview your page here, you’ll see a blank screen. This is totally normal because we still need to add the necessary markup in our page-landing.php file for our content to display. Now, preview your landing page and you should see a large featured image, nothing else. Preview your landing page again. You should see your site title, a white background, and the large featured image as the background image. To remove the background color, add the following style in your style.css file. As of now, you can see your site title and your featured image as a background image on your landing page. To display the rest of your landing page content, we’re going to add the required markup. After that, your landing page is almost complete. View your landing page and you should see the following: your large featured image as the background image, your site title, and the rest of your content including your offer. To make your landing page stand out visually, you need to add the necessary styles. Open your style.css file and add the following code in it. Then, save the style.css file and reload your landing page again. You can see the final result of our custom landing page in the screenshot below. For more help on creating a custom WordPress landing page, you can download this landing page tutorial for free. While I used the twenty-sixteen theme, the steps outlined in this post can be used with your existing theme as well. If you’re interested in learning about landing page design, copy, and optimization, read our post on how to create effective squeeze pages that drive conversions. Tahir Tauos writes about WordPress, Theme Development, Responsive Design and Blogging. He's the founder of JustLearnWP.com, where you can find articles and tutorials about WordPress and Blogging. 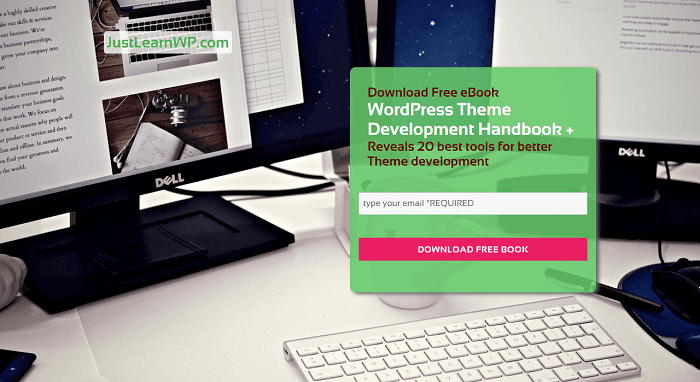 Download his Free WordPress Theme Development Toolkit, which reveals the 20 best tools to create powerful WordPress themes. I Plan On Running WooCommerce. Have Any Tips?